From cookie decorating to ugly sweater parties, the holidays are in full swing. With all the hustle and bustle that comes with this cheerful season, it is important to keep the safety of your furry friends in mind. Here are 7 tips to keep your pets happy and healthy this holiday season. It is good to provide your pets with a small treat once in a while. However, give them pet treats or pet-friendly foods such as peanut butter, chicken, or cheese. Certain human foods, especially traditional holiday foods, are high in sugar, seasonings, and fat which can make your pets sick. Keep the pumpkin pie for yourself and give your pup a sweet treat of their own. Although it may be cold outside, and your pup may not be panting as he did in the summer months, it is important to remember your furry friend’s hydration. Drinking enough water helps with their digestive and metabolism functions. A good rule of thumb is to give your pet 1 oz of water for every lb of body weight. 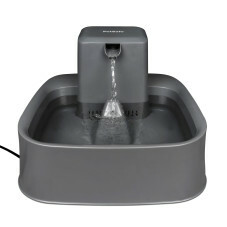 A Drinkwell® Fountain is a great way to ensure your pet has access to plenty of fresh, filtered water. Filtered water also encourages your four-legged pal to drink more, keeping him feeling his best. While you may know how to care for your pet, other family members visiting might not take the same precautions. Politely request everyone that visits your home to avoid giving your pets any treats or food from their plates. Additionally, if there are certain commands your pet responds to, be sure to communicate them with your guests. To avoid mealtime interruption, give your pup a treat-filled toy, like a PetSafe® Chilly Penguin, to keep them preoccupied. This freezable treat holding toy can be filled with treats like broth, peanut butter, yogurt, or wet dog food, to provide long-lasting entertainment. This will help ensure your furry friend’s mind and tummy are engaged. Seeing so many people at once may be unusual for your pup. They may also be stressed, unwilling to mingle, or shy. 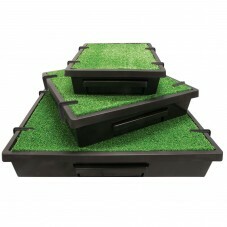 Provide them with a quiet place in your home where they can hide and relax from all the noise around them. Ensure that the room has their favorite items such as blankets, fresh water, and toys. The PetSafe® Busy Buddy® Chamomile-Scented Calming Toys dispense food or treats, keeping your pup busy. The chamomile-scented rubber helps keeps your dog relaxed, minimizing the stress they may feel from holiday visitors. Candles are usually synonymous with the season. If your favorite holiday candle has a strong scent, your furry friend may be attracted to the small and could accidentally knock the candle over. This can cause a fire that can burn the animal or other items at home. Keep any flaming candles away from your pet’s reach and do not leave burning candles unattended. A safe, flame-free option is an LED, battery operated candle. The holiday season is quite a cold period and while the snow outside is fun to play in, freezing temperatures can be dangerous for your pets. It is important that pets keep warm during their time outdoors. Consider buying him a coat that has a belly and neck coverage. Ensure there is no salt or de-icers on the ground before taking him outside as this can cause damage to their paw pads. If you are potty training during the winter season, consider buying an indoor pet potty for times when the weather is unbearable. You wouldn’t forget your human family members holiday presents, so don’t’ forget your family member. Whether it’s his favorite toy or a new harness to help make walks a little easier, we’ve got something for everyone on your “nice list”.